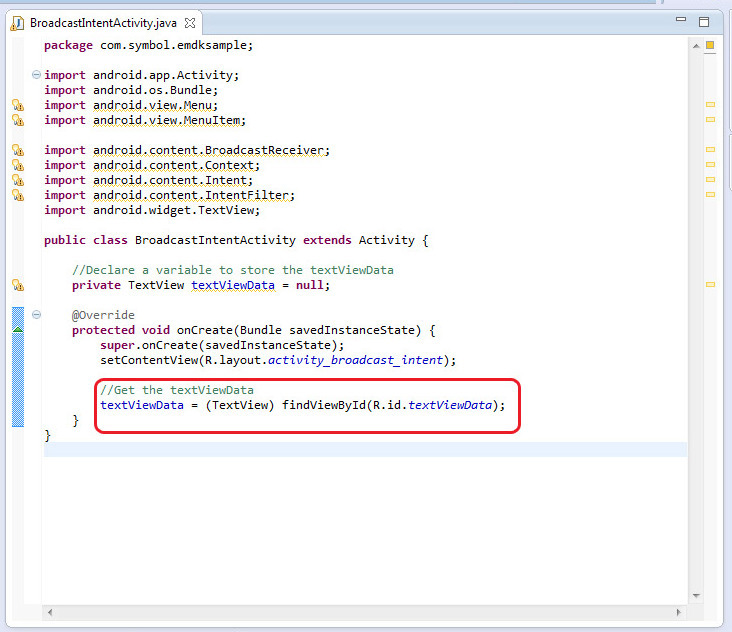 This guide will walk you through adding broadcast intent support to the Android application you made using Developing an EMDK for Android Application Part 3. 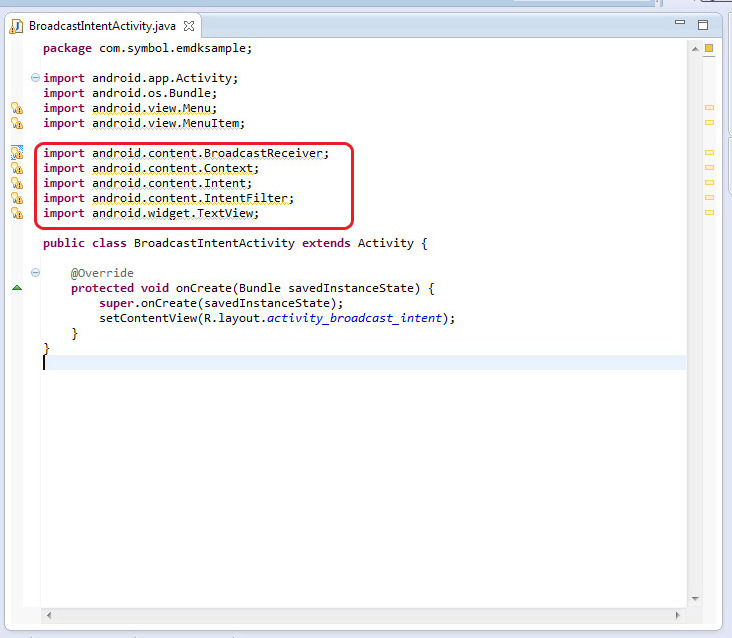 Using EMDK Wizard and EMDK for Android Broadcast Intents. 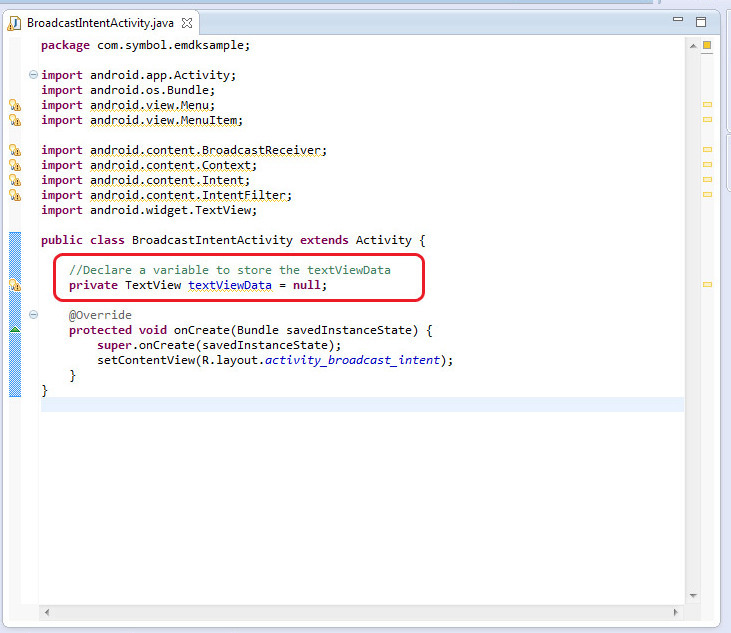 First we will add a new activity that will be used for listening and displaying Barcode data to the user. 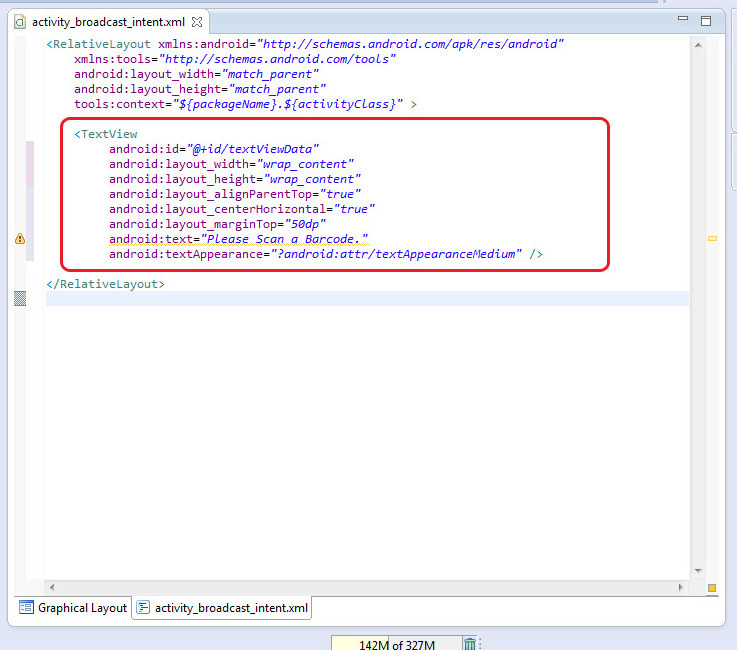 Select "EMDKSample" from "Package Explorer" in Android Studio. Right click and create a new "Empty Activity" with the name "BroadcastIntentActivity"
Next we will update "MainActivity", adding a button to launch our "BroadcastIntentActivity". 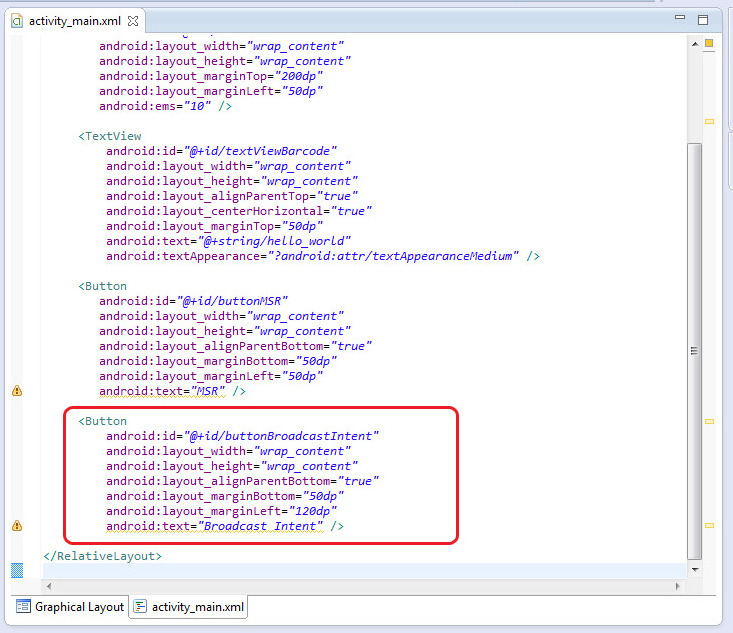 Add the following Button to "activity_main.xml". 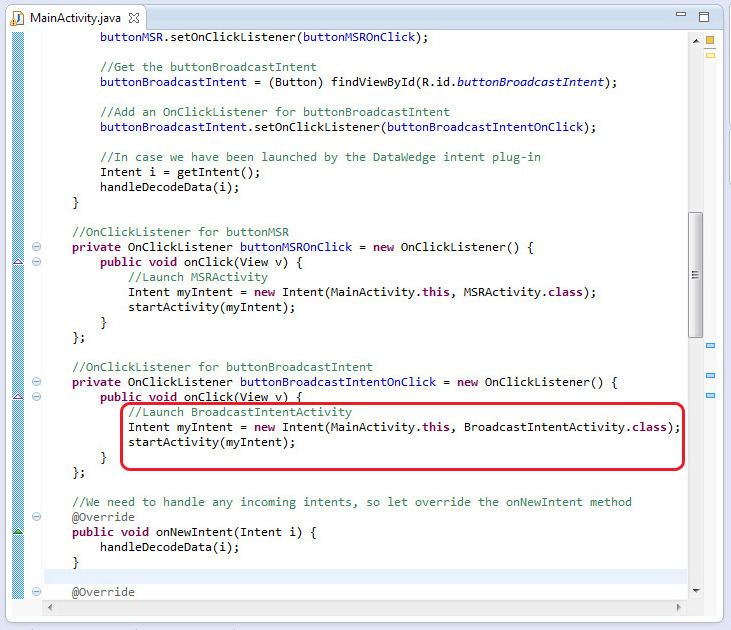 This Button will be used for opening "BroadcastIntentActivity". 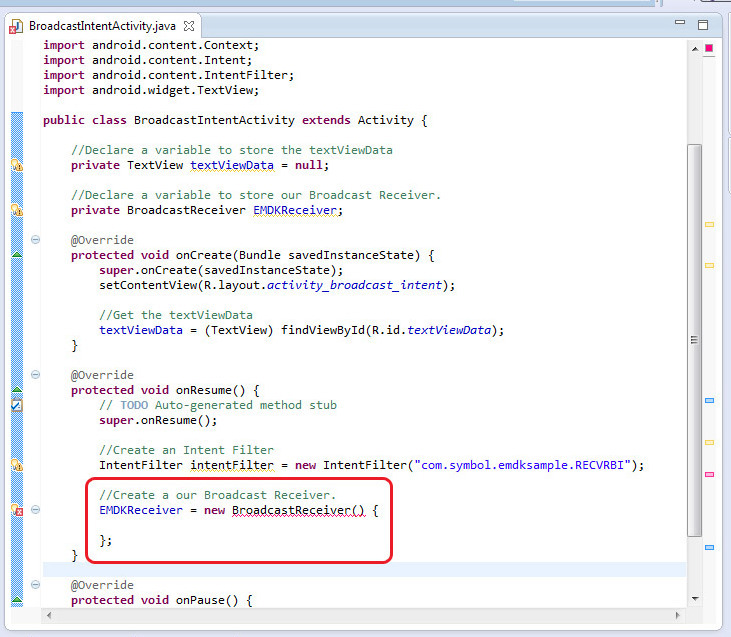 Declare a variable inside "MainActivity" to store "buttonBroadcastIntent". 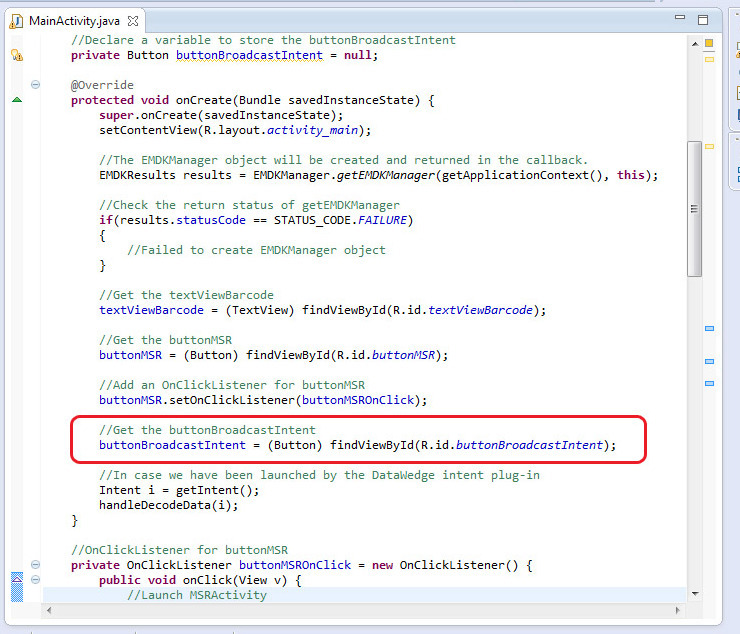 Inside "onCreate" get a reference to "buttonBroadcastIntent". 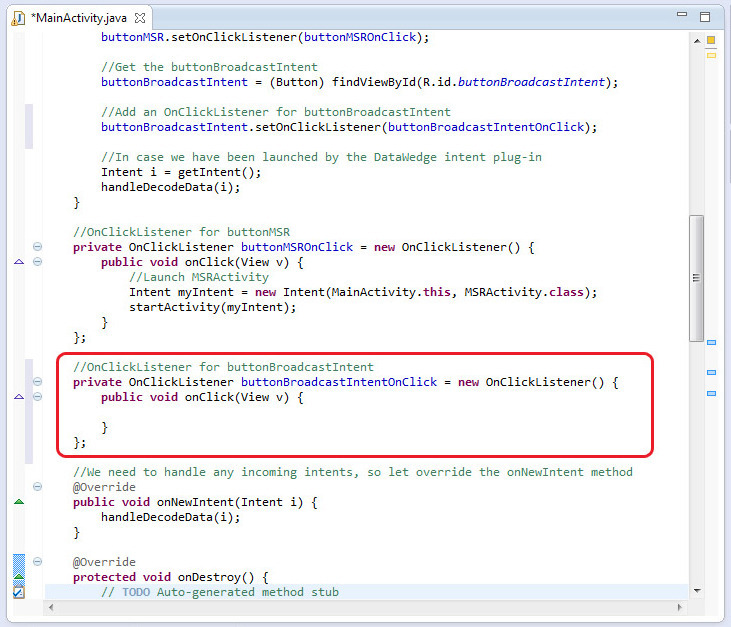 Add the following code to "onClick" to launch "BroadcastIntentActivity". 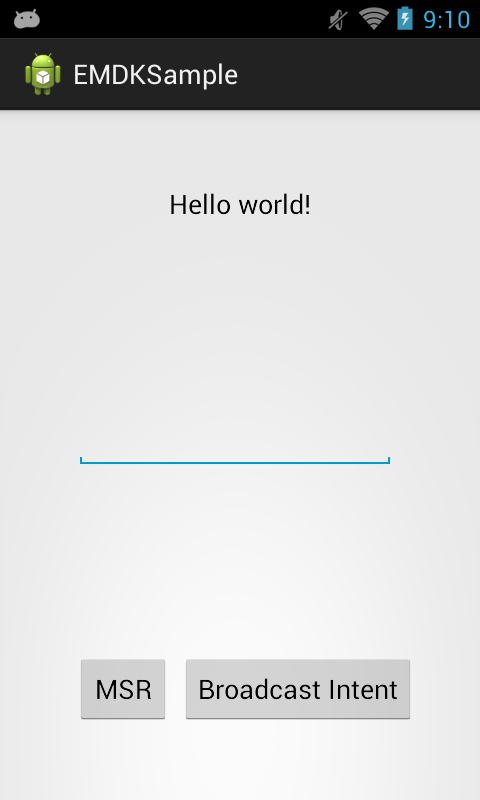 Then we will create the UI for displaying Barcode data to the user. 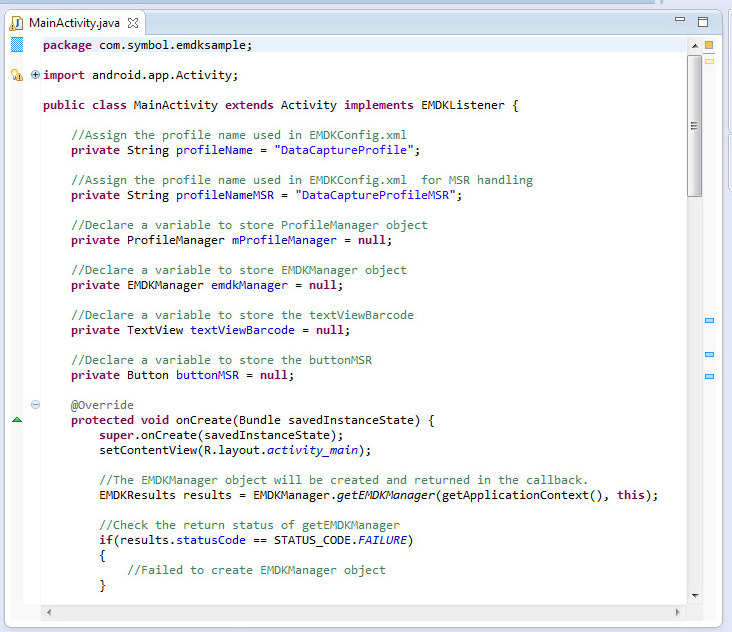 Select "activity_msr.xml" from "Package Explorer". 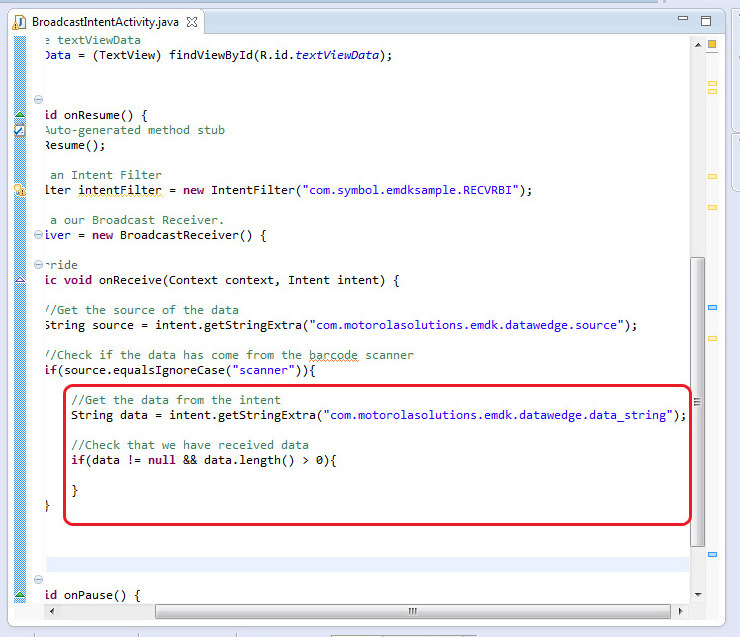 Next will will create a Data Capture profile that will be active on "BroadcastIntentActivity" and send Barcode data using a Broadcast Intent. 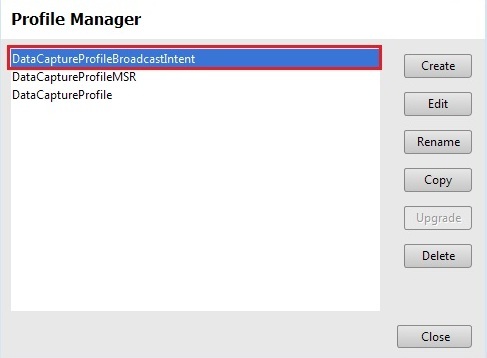 Provide "DataCaptureProfileBroadcastIntent" as the Profile Name for this tutorial. 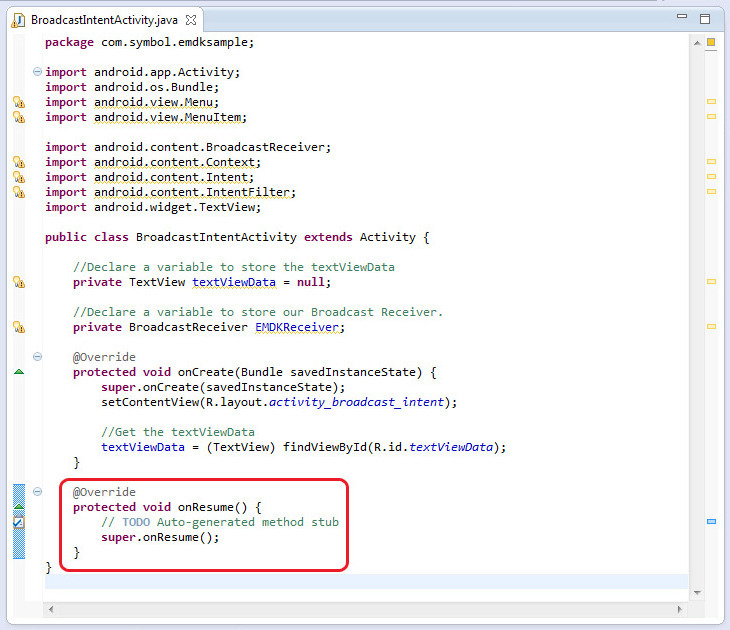 Enter "BroadcastIntentActivity" as the activity name and click apply. 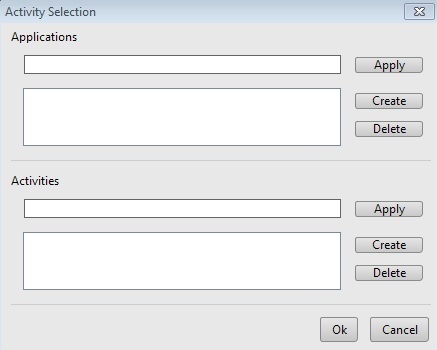 select "Barcode" from the list of "Available Features" and add it to "Selected Features" using the arrow. 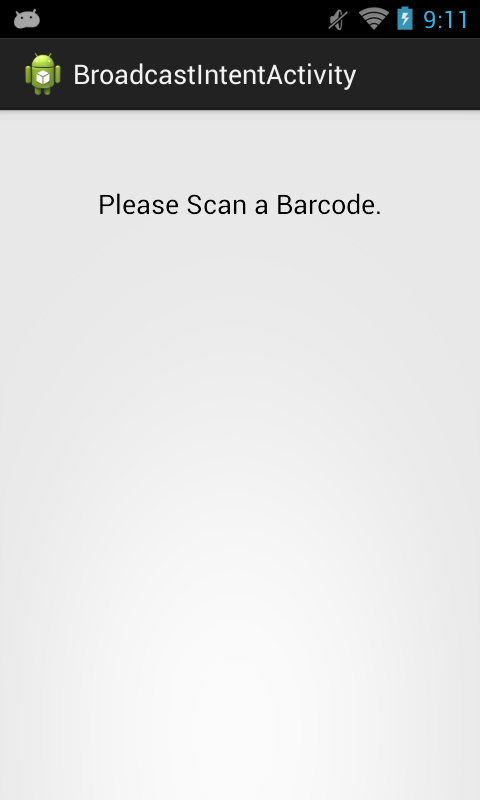 Change "Barcode Scanner Input Enable" to "Enable". 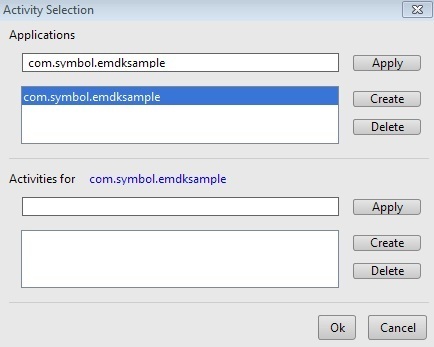 For "Intent Output Action" enter "com.symbol.emdksample.RECVRBI". 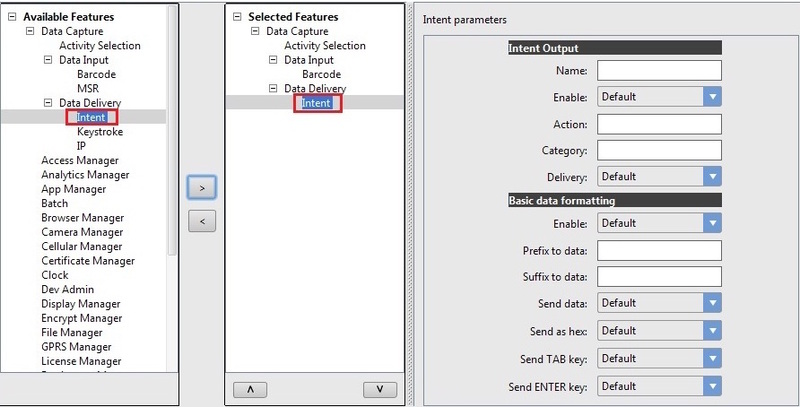 Switch "Intent Output Delivery" to "Broadcast Intent". 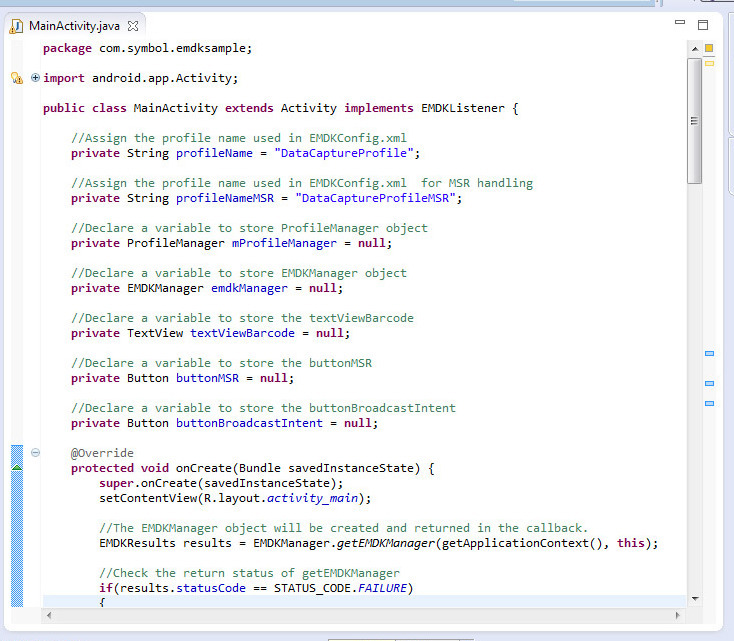 Now will register our new Data Capture profile in "MainActivity". 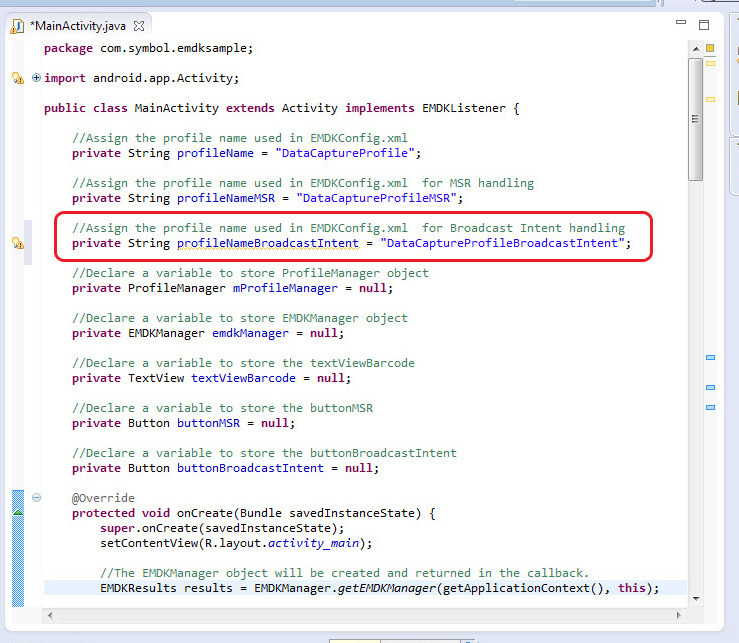 Inside "MainActivity" add the following code to hold the name of our Broadcast Intent profile. 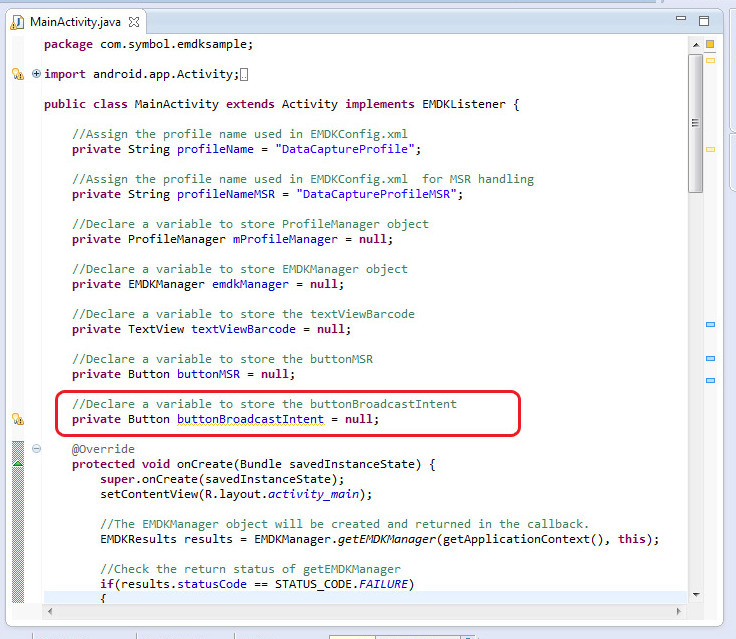 Inside "onOpened" add the following code to register the Broadcast Intent EMDK profile. 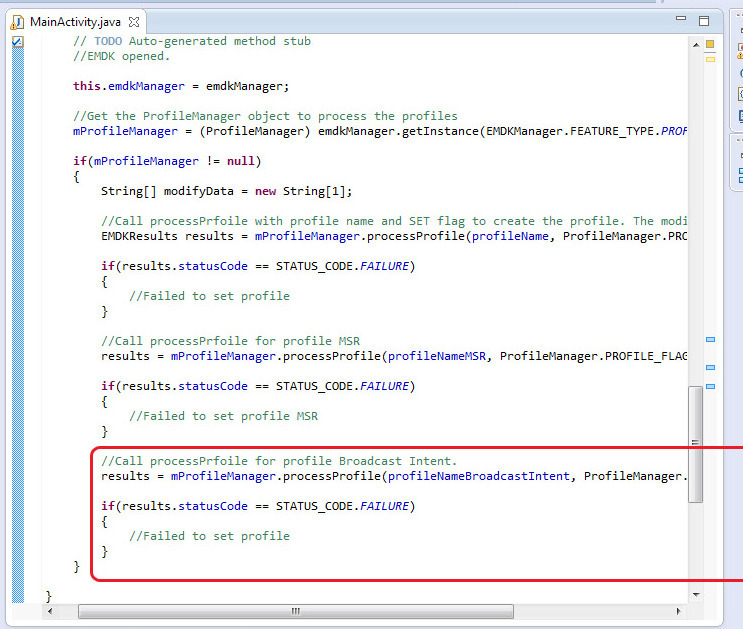 //Call processPrfoile for profile Broadcast Intent. 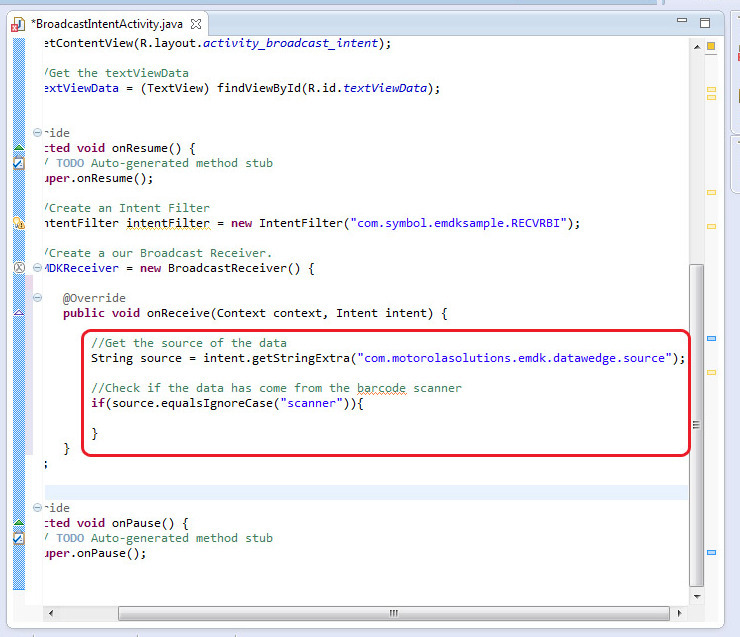 Newt we will add the code to listen for our Broadcast Intent and display the Barcode data to the user in side "BroadcastIntentActivity". 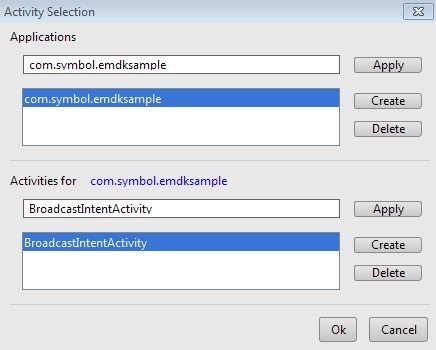 Select "BroadcastIntentActivity.java" from "Package Explorer". 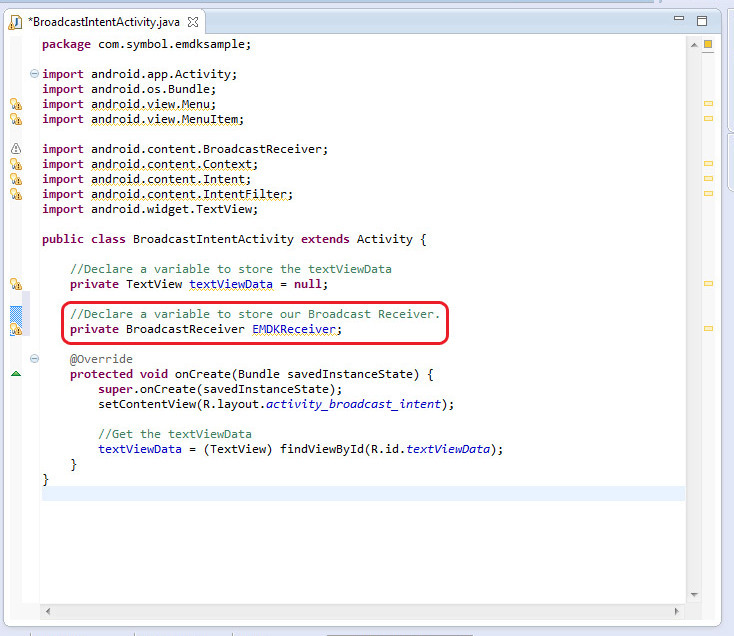 Add a global variable to BroadcastIntentActivity to hold our Broadcast Receiver. 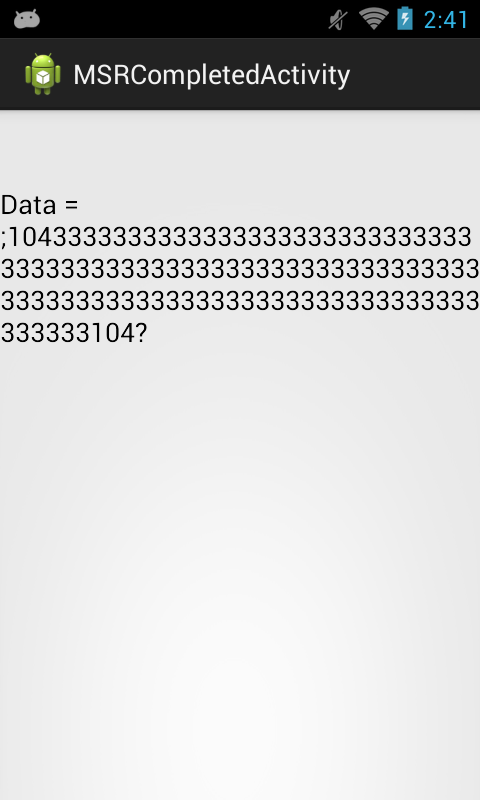 //Declare a variable to store our Broadcast Receiver. 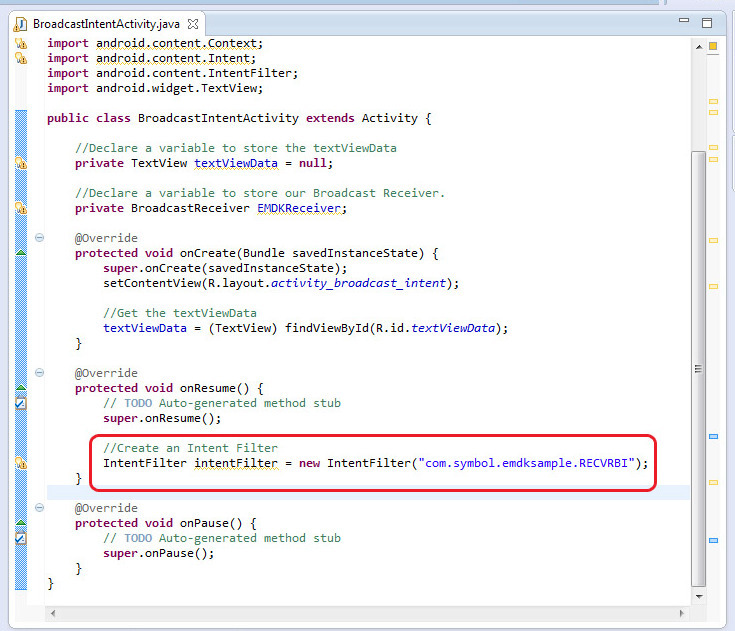 Add the following code to "onResume" to create an Intent filter. 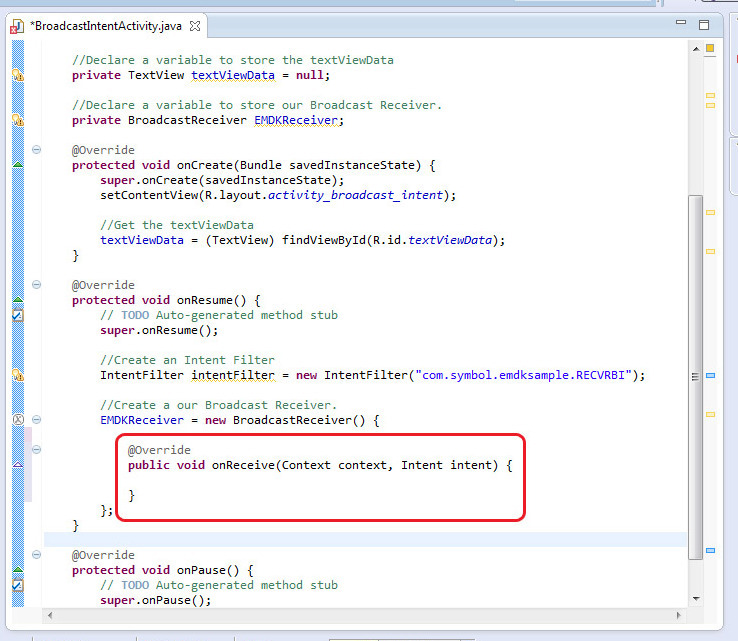 Add the following code to "onResume" to create a Broadcast Receiver. 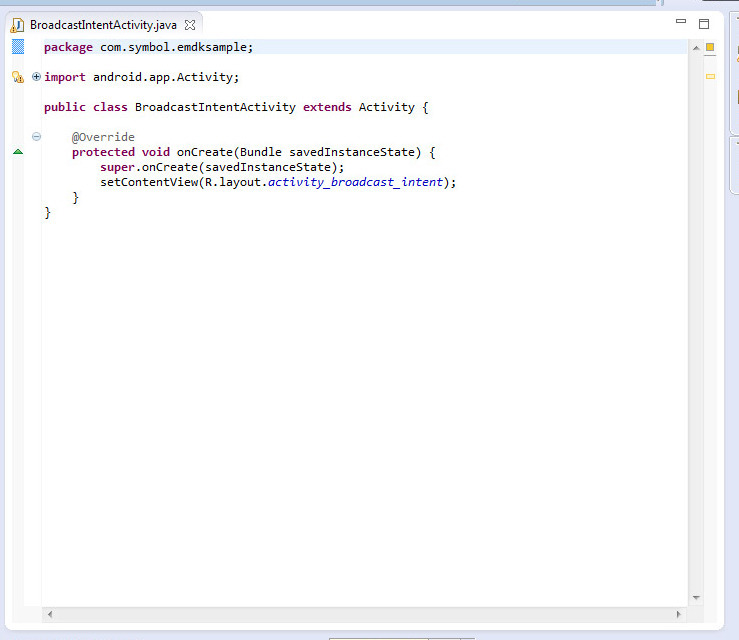 //Create a our Broadcast Receiver. 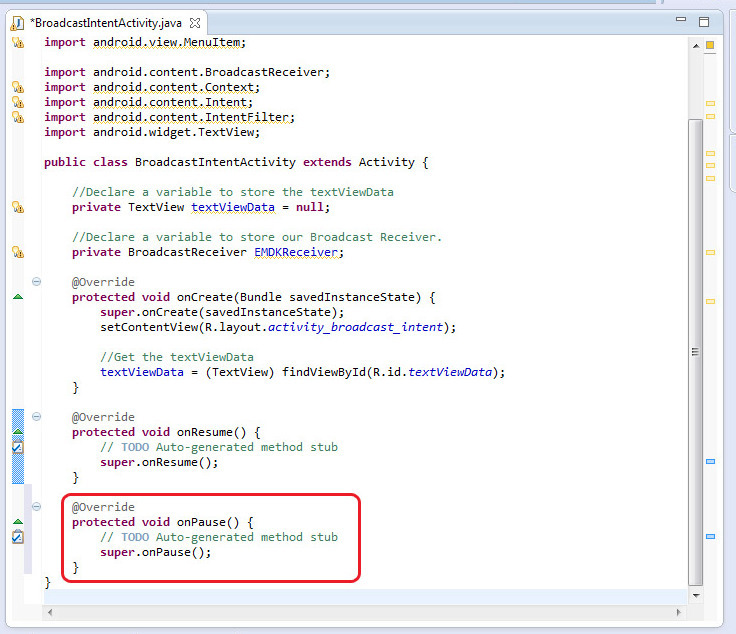 Override "onReceive" inside the Broadcast Receiver. 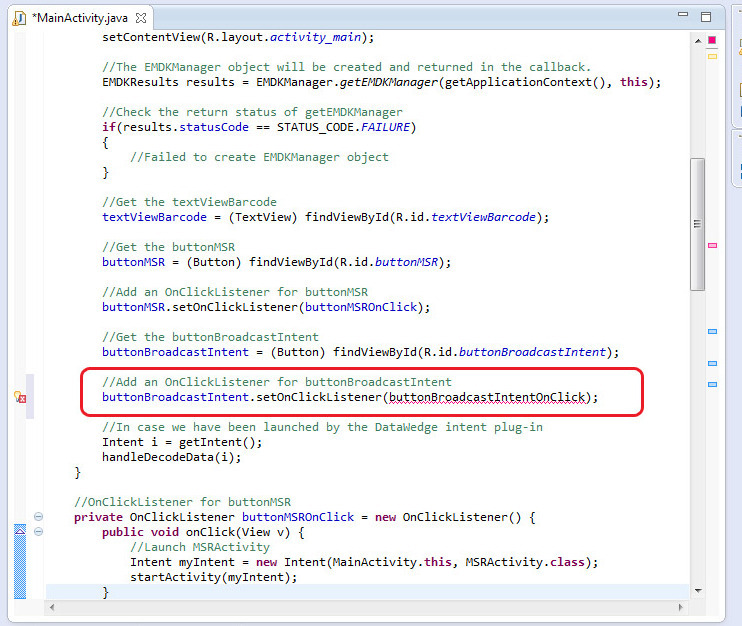 Add the following code to "onReceive" to check if the data is coming from the Barcode scanner. 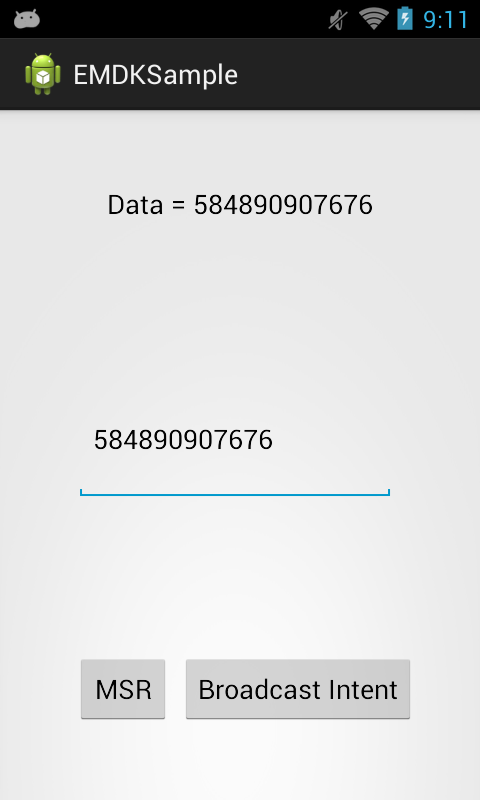 Add the following code to get the data from the intent. 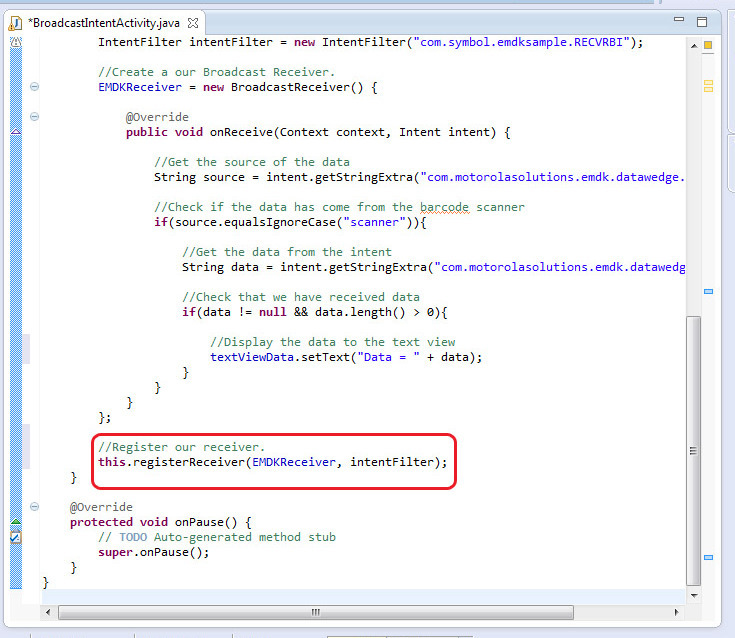 Add the following code to display the data to the TextView. 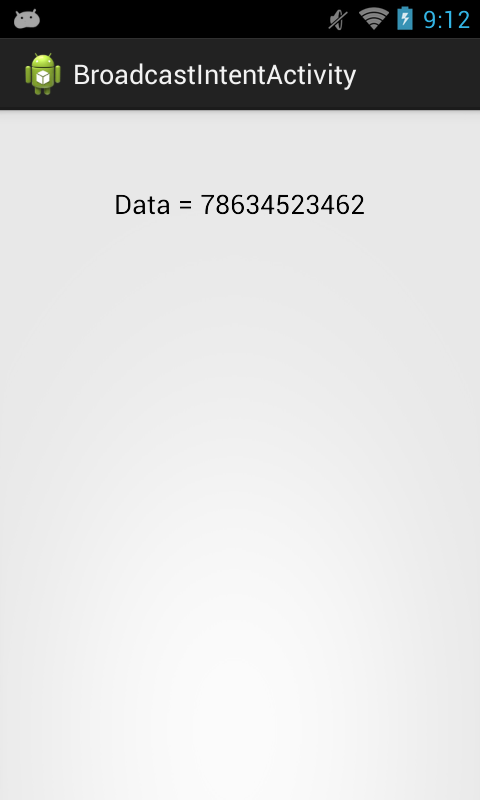 Add the following code to "onResume" to register our receiver. 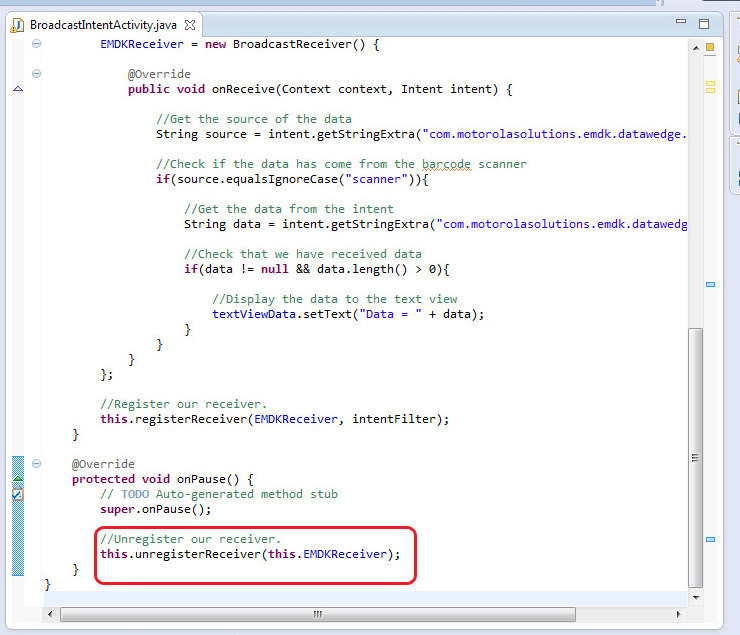 Add the following code to "onPause" to unregister our receiver. 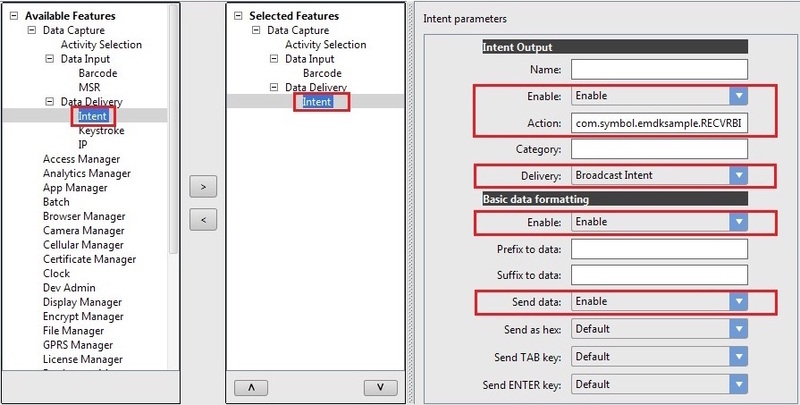 Like before the scanned data will be populated in the Edit Text field Through the previous Keystroke Intent and will appear on the TextView using the previous Datawedge Intent. Press the button "Broadcast Intent". 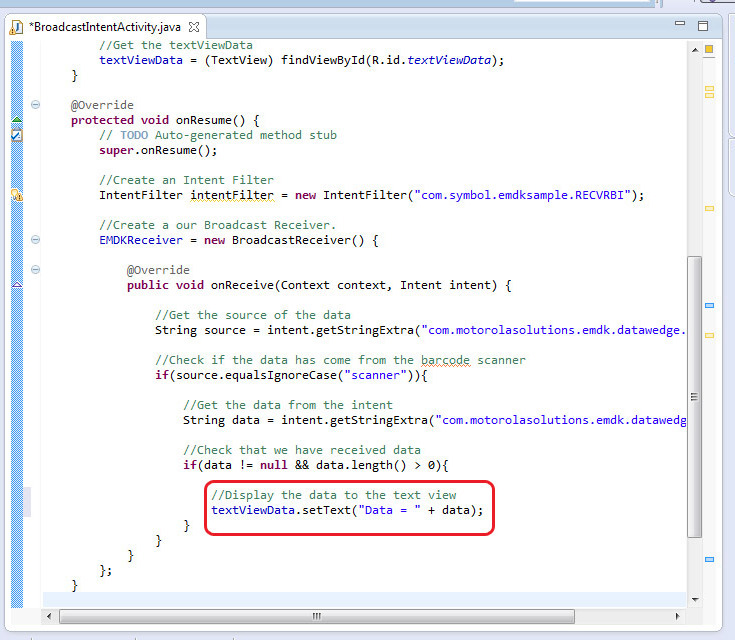 The TextView will be populated by the Broadcast Intent. 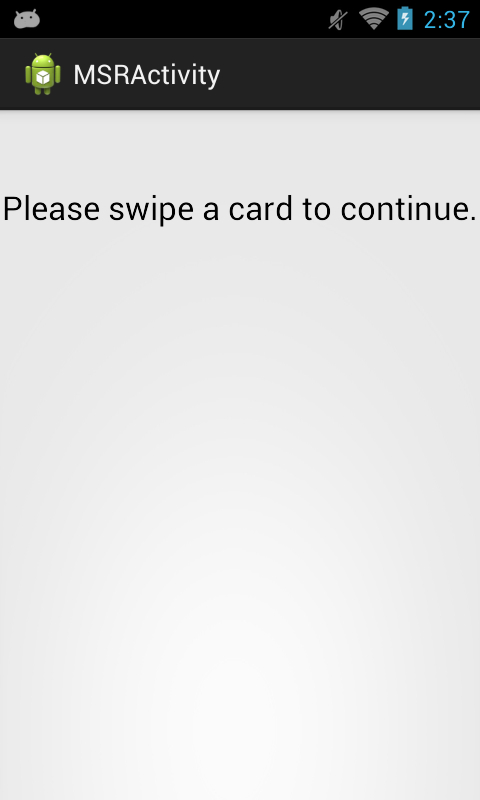 Press the back button to rerun to the main screen. 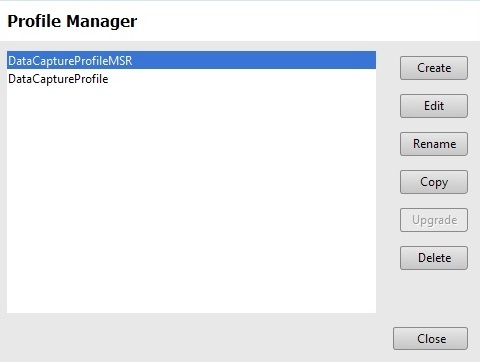 Press the button "MSR", like before the MSR screen will come up.